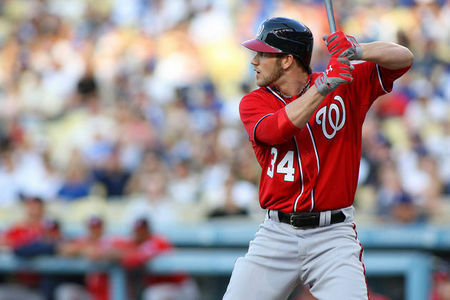 ← Will Bryce Harper Lead the Nationals to the Playoffs? Bernie Olshansky: For prospect watchers, last Saturday was one of the most exciting baseball days in a long time. Not only was Angels prospect Mike Trout (20) making his season debut against Cleveland, but Bryce Harper, the Nationals prospect and teen-wonder at only nineteen also made his highly anticipated major league debut against the Dodgers. Amazingly, two of Baseball America’s top three prospects debuted on the same day. Harper’s first and second at-bats were a couple to forget, but his third was one to remember. He roped a hard line drive over Matt Kemp’s head in center for a stand-up double. Trout’s debut was nothing special, but after hitting .408 in the minors this year he’s bound to get it going. Harper, hyped as more of the superstar type, catches eyes with his batting practice sessions as he launches balls into deep right field. In Los Angeles before his debut, he was said to hit three of his first six pitches into the bleachers at Dodger stadium. Harper had a very quick ascension to the majors, as he graduated high school after his sophomore year, played a year of junior college ball, and was drafted Number One overall in 2010. He spent just one full year in the minors. Mike Trout, just a year older than Harper, has one more full year of professional experience under his belt. Trout promises to be a well-rounded player with better speed and hitting-for-average ability than Harper, but in the end is trumped by Harper’s power and arm. Trout, according to Baseball America’s 20-80 scale (with 20 being worst, 80 being best possible, and 50 being the average major leaguer), scores a 70 in overall batting, 65 in power (pretty good), 80 in speed (exceptional), 70 in defense, and 50 on his arm. All of his points are spread evenly in the categories, suggesting his only weakness is his arm—which is still average. Harper scores a 60 on his overall batting, 80 on his power, 55 on his speed, 60 on his defense, and has an 80 arm. Harper’s only weakness is his speed, which is still 5 points over the average major leaguer, and doesn’t surprise anyone with his 80-power. According to Baseball America, Harper has the edge on Trout with an overall rating of 80 while Trout has an overall rating of 75 (two excellent ratings). Both are rated as low-risk at succeeding in the majors. These ratings are meant as the projected ceiling of both players, not necessarily the skill set that they presently have. Notable players who would qualify in the 75-80 range would be Albert Pujols, Alex Rodriguez, Derek Jeter, and Roy Halladay. Looking at pure skills, over time Harper should be better than Trout as a hitter. Trout has a slight edge on overall defense, even though Harper has a cannon for an arm (as we saw on his throw to the plate last Saturday as he tried to nail Jerry Hairston Jr. and again on Tuesday when he attempted to throw out a tagging John McDonald on a Justin Upton fly). This year, Trout has the slight overall edge on Harper due to his experience in the majors last year. Trout already got his “firsts” out of the way and doesn’t have to worry about hitting his first home run, stealing his first base, getting received in his home stadium for the first time, etc. Trout also has the benefit of being on the West Coast, away from the aggressive East Coast media who are constantly reporting on Harper’s every move. Trout also wasn’t the one being constantly referred to as “the Natural” or “the next greatest” from the age of 16. The world has been waiting for Harper’s debut ever since he graduated high school. Many people saw the video of him launch his five hundred plus foot home runs in Tropicana Field three years ago (link at the bottom), so unfortunately for Harper, those people expect him to hit like that every time he comes to the plate. Harper faces far more public pressure than Trout, so it all comes down to the way he deals with it. For Harper, his call-up wasn’t based on his performance in Triple-A (hitting .250 with one home run and three RBI); it was due to an injury to Ryan Zimmerman. No one knows how long Harper’s stay could last, whether it is short-term or for good. There is a chance that once Zimmerman comes back, Harper could be sent down. The Nationals could have brought Harper up just to get all of the debut hype out of the way. In contrast, Trout was tearing up Triple-A, hitting .403 with one home run and thirteen RBI. The Angels released Bobby Abreu in order to call him up. He was ready while Harper might not have been. By hitting in the seven spot in the line-up, pressure is taken off Harper a bit while Trout debuted hitting in the leadoff spot. The Angels started off expecting more of Trout—but that was expected because he had some brief major league experience. In my opinion, Trout is here to stay while Harper could be sent up and down a few times depending upon his performance and the health of his teammates. Although the Nationals are off to a hot start, they most likely will not keep up their performance in such a tough division that includes the Phillies and Braves (and maybe even the Marlins?) as contenders. If the Nationals do not contend, Harper could stay on the big club longer, perhaps allowing him to get the experience of struggling through his first major league slump instead of returning to Syracuse (Triple-A). Trout can immediately contribute to the Angels, who are off to a slow start but will ultimately contend in the weak American League West. The Angels could be one of the wild cards in the American League behind the Rangers once they pick it up, Trout perhaps a big part of their push. This week while Trout’s bat was quiet — hitting only .143 with two hits: a single and a double, Harper’s was the opposite. He is hitting .385 with three doubles and two singles to go along with two RBI (as of Wednesday night). Both players should put up decent numbers this year, but each will have their own struggles no doubt. Overall, Mike Trout is set up to have a better 2012 season. But in my opinion, Bryce Harper will eventually surpass him and turn out to be the better big leaguer due to his more sensational skills. Either way, the Angels and Nationals should have two bona fide superstars on their rosters for many years to come. Posted on May 3, 2012, in MLB Player Profiles and tagged albert pujols, alex rodriguez, anaheim angels, baseball, Bobby Abreu, bryce harper, derek jeter, justin upton, matt kemp, Mike Trout, mlb, prospect, rookie of the year, ryan zimmerman, washington nationals. Bookmark the permalink. 4 Comments. Great article. I think both players are going to have great years ahead of them, but I enjoy watching Trout play more. Watching this guy play defense, run and hit is awesome. We all are lucky to see these two play. 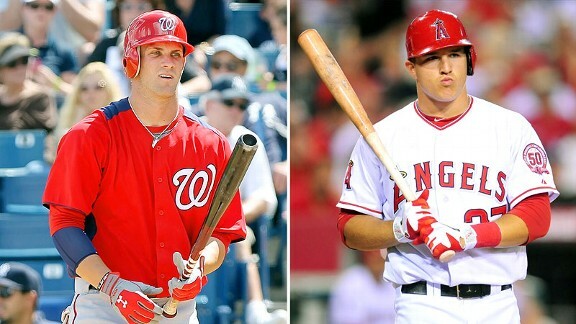 Pingback: Washington Nationals Harper vs Angels Trout: Who's better?